31-year old Spanish professional tennis player Rafael Nadal, famed as The King of Clay, currently is ranked the world No. 1 in men's singles tennis by the Association of Tennis Professionals (ATP). Since his professional career debut in 2001, Nadal has won16 Grand Slam singles titles totaling his career prize money to be over $96 million. Alongside his magical career earnings, Rafael Nadal is also blessed with lucrative endorsements. With his business investments and career earnings, Nadal is estimated to be enjoying the net worth of $140 million that also includes his luxurious house and car collection. Scroll down for the detail. The left-hand tennis player, Rafael seems to be blessed with tremendous success, be it in his professional career or his love life; Nadal is, in fact, dating Xisca Perello. Holding the record of 31 ATP World Tour Masters 1000 Titles and 20 ATP World Tour 500 Tournaments, Rafael Nadal is reported to have the estimated net worth of $160 million as of 2018. His net worth was reported to be $125 million in 2015, as per The Richest. The prominent player in the upcoming 2018 US Open and 2018 French Open, Rafael Nadal is reported to have amassed the prize money of $96,706,186 by 2018. Ahead of him are Roger Federer and Novak Djokovic with the prize money of $111.89 million and $109.81 million respectively. Well, the Spanish tennis magician back in 2017 made $3.7 million after winning over Kevin Anderson to claim the 2017 US Open title. Seems the million dollar fortune has stick tight with Rafael Nadal since the beginning of his career. Have a look at the prize money received by him over the years. Well, the earning from the games is not his only source of income. His massive endorsements also pay him in millions. Let's know. As reported, Rafael Nadal endorses brands like Nike, Babolat, Kia Motors, Telefonica, Banco Sabadell, Richard Mille, Tommy Hilfiger and Emporio Armani. While at the age of 13, Nadal received a Babolat racquet sponsorship and still is endorsing the brand. 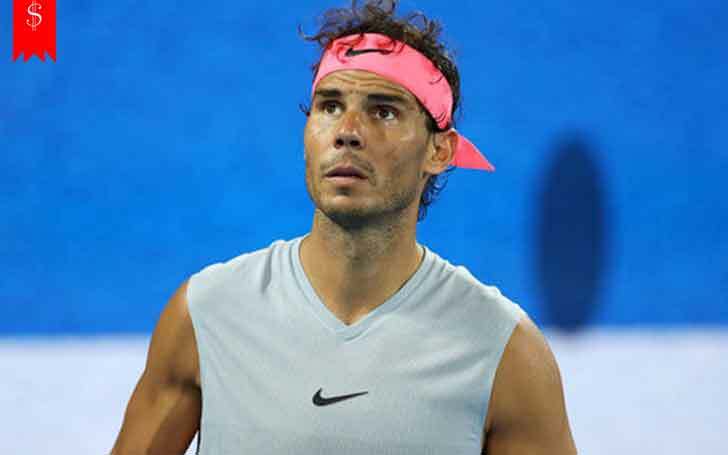 Nadal, the brand ambassador of Telefonica, a Spanish multinational broadband, and telecommunications, became the global brand ambassador of Kia Motors due till 2020. In 2008, Rafael Nadal signed with Nike, followed by its contract extension in 2014 which is projected till 2018 with the 4-year deal worth $50 million. Also, for the spring/summer 2011 collection, Nadal replaced Cristiano Ronaldo as the new face of Emporio Armani Underwear and Armani Jeans. 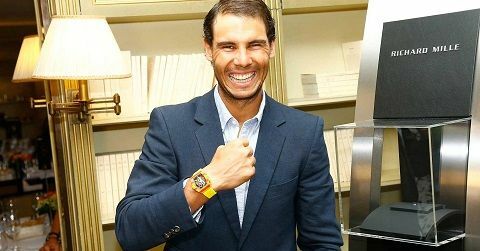 In 2010, luxury watchmaker Richard Mille, in association with Nadal, made an ultra-light wristwatch called Richard Mille RM027 Tourbillon, worth $525,000. As of 2017, he wears his new $725,000 watch manufactured by Richard Mille. In June 2012, Nadal joined the group of sports endorsers of the PokerStars online poker cardroom. As reported, the annual revenue of Rafael Nadal from endorsements alone is $26 million. Reportedly, Nadal owns a house in Porto Cristo, Spain, which he bought in 2012 for $4.69 million. Well, his family home also lies nearby where his parents live. Besides, Nadal currently resides in a house in Manacor, on the island of Mallorca. However, the purchase detail of the property is not out yet. 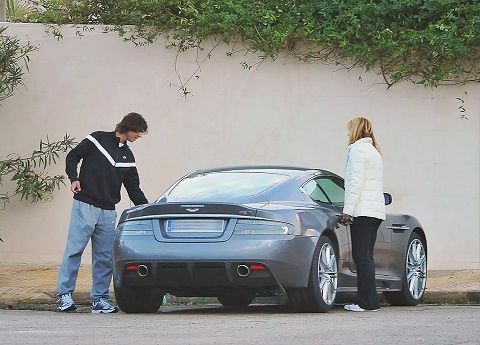 Talking about his cars, Rafael Nadal's collection includes Aston Martin DBS, Ferrari 458 Italia, Mercedes AMG GTS, Mercedes SLK, Mercedes Benz SL55, Mercedes Benz C350, and many more. Probably it's not an end to the millionaire tennis player's property extension. Let's wish him best and see what the future has to offer.